Did you catch Part One of this wedding? If not, you should…it’s absolutely as sweet, genuine and adorable as it gets. Getting ready and a first look graced the first blog for Kyle & Hali’s big day and I am happy now to introduce part TWO! Kyle always makes me laugh, even on bad days. He is a great source of support for me as well, this last year has been unpredictably tough and I can remember several times when I just wanted to give up and stay in bed because there was just so much that I didn’t want to face. Kyle was there to hold me, remind me that all was not lost, and to tell me that I was going to make it through. I also love his laugh and our conversations. we study and work in such different fields, its great to talk to him about so many different things because we learn so much from each other….. he really challenges me and I love that. hmmmm that’s tough, because it wasn’t like it was one big thing….. it was lots of little things. It was text messages he sent to me when he knew I was asleep just so I would wake up to something sweet. His dancing……hahahahahaha always makes me laugh. he grew up a club kid in NYC…very into the house clubs. I grew up dancing to hip-hop, salsa and ballroom….very different styles. I will never be able to dance to house the way he does and don’t get me wrong, his dancing isn’t the best, but he LOVES it and he owns it, everyone else be damned. I love that about him, he’s doing his thing and u know he is loving every minute. I really fell in love with his ambition and self possession. he was so aware of who he was and where he was headed, he wasn’t playing games. I loved that. HAHAHAHAH I also loved that he was a legitimate pirate fighter. No kidding, when he was in the Navy, he fought the pirates off the coast of Africa… a regular swashbuckling, pirate fighting, yar matey, tattooed orlando bloom….. what girl doesn’t want to be with a pirate fighter??!!!!!! totally had me then. we watch jeopardy every time we sit down to eat and play each other, cash cab too. right now we both go to school and work, but when we had more time we played sports and went to museums. we go to plays as much as we can. we started a book club for just us, so we could read the classics and discuss them. we cook together too. I knew there was something different about Hali from the moment we met. It is crazy though because we are so different in so many ways that falling in love the way we did almost seems illogical. Even though the timing of our first encounter was hardly ideal (I was soon to leave for NY and Hali was soon to leave for Indy), if we had met at any other time in our lives we probably would have passed each other without a second thought. The last few years have been crazy. We have shared so many memories, from romantic candlelit on Mulberry St to losing her sister, Lydia, in London and putting in a missing persons report with the police, it is hard to isolate just one memory. I guess my favorite memory is the one i get to experience every day. Getting to cook dinner together and then sit back and enjoy a competitive game of Jeopardy. As busy as the both of us are and as hectic as both our schedules have been, it would make sense that our relationship may be a little strained. Thankfully this is not the case and I think that our ability to just shut everything else out for a few hours, be ourselves together, and just chill out is a big reason why. Love these!! 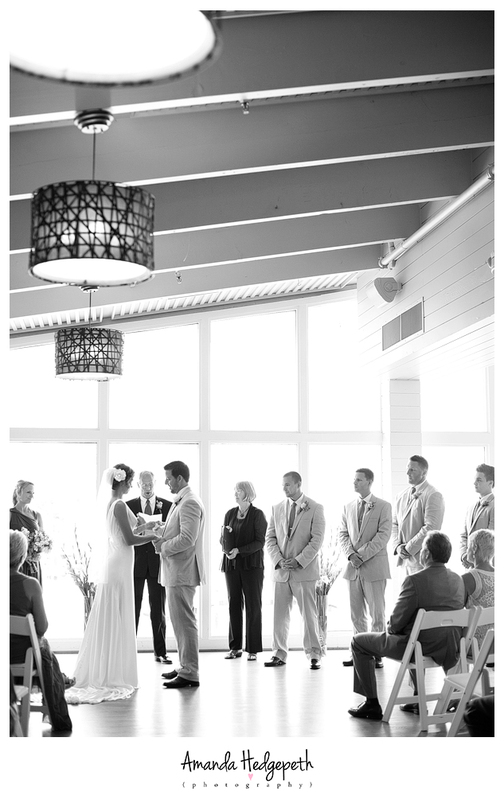 The lighting is so soft & perfect for a beach wedding. I also LOVE the bridesmaids dresses! Where are those from?? thank you Ahna, the bridesmaids dresses are courtesy of Henkaa….. the girls loved them!!! You can feel the emotion between them just looking at them!! Nothing looks better on a woman than being in love & Hali has got it!! Gorgeous bride, beautiful couple! !